Osterley is an affluent district of the historic parish of Isleworth in west London approximately 9.5 miles west south-west of Charing Cross and is part of the London Borough of Hounslow in the historic county of Middlesex. Most of its land use is mixed agricultural and aesthetic parkland at Osterley House (National Trust), charity-run, much of which is open to paying visitor access. Readers will know that I really don't like the word café being associated with an English tea room. I think the café word is generally associated with a greasy café where fry-ups are the main theme. However, in West London, or indeed London generally, the word café is often associated with a nice restaurant or tea room. 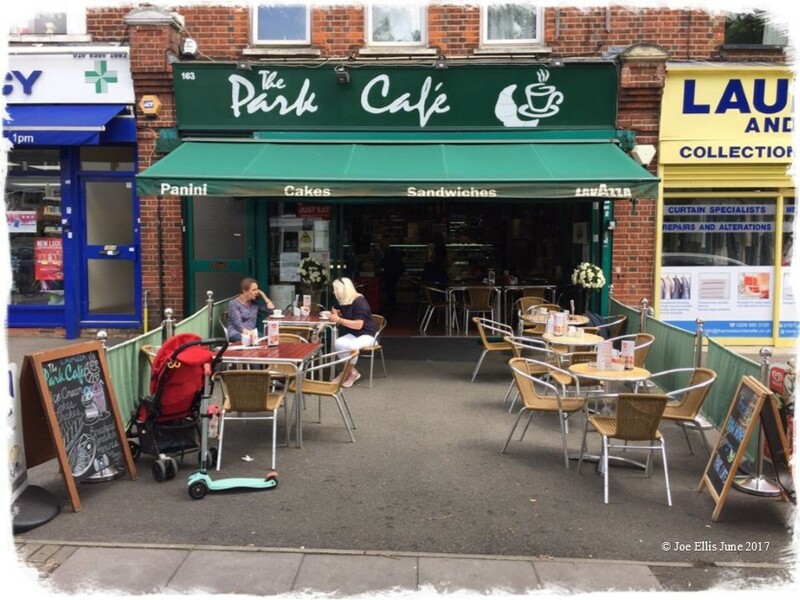 The Park Café fits well within the definition of a tea room and I have no problems writing a review following my recent visit. I popped in to take lunch which consisted of a croissant filled with ham and cheese (see photo below). This was off-menu, something I devised and I enjoyed it immensely, washed down with two pots of tea. I am told by the owner lots of celebrities who live local use the café frequently. The only 'celebrity' who visited when I was there was…me! Considering I was the only customer, getting served was not easy, despite standing at the counter and making myself known to the owner. However, I did get served eventually and enjoyed my visit. On a hot sunny day, this would be ideal to take lunch and sit outside underneath the awning as I did and people watch while you eat. You can dine inside, but there are lots of small tables and chairs close together, which can be a tight fit. Food was great, but West London prices; staff nice and on-street parking is easy if you are willing to pay. I do offer a Recommended rating to The Park Café.